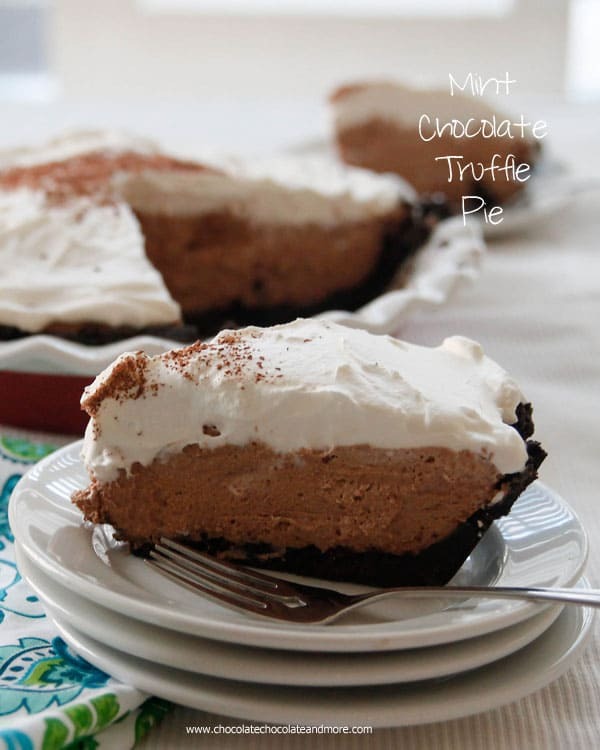 Mint Chocolate Truffle Pie - Chocolate Chocolate and More! 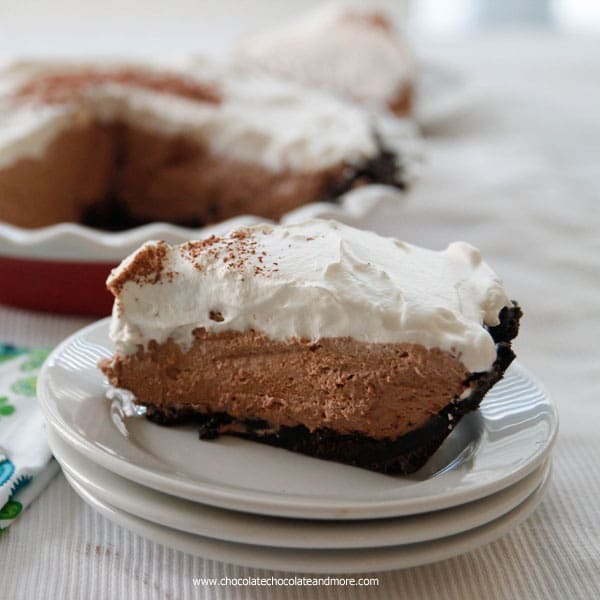 .Mint Chocolate Truffle Pie-with an Oreo crust, silky, creamy chocolate mint filling and fresh whipped cream, this easy no bake pie will satisfy all your mint chocolate cravings. Joan started this post before she died. She developed the recipe and photographed it but never wrote any text. It somehow got scheduled (my mistake) so originally appeared as just photos and a recipe. I have to tell you. She left behind a real gem with this recipe. Joan loved chocolate and mint. When we were kids, we’d share tubs of mint chocolate chip ice-cream – just the tub and a couple of spoons. Who needs bowls when you’re going to eat the whole thing anyway? Joan always had some mint chocolate chip ice-cream in her freezer and. I think the love of chocolate and mint must be genetic because my kids love chocolate and mint and so do Joan’s. This recipe is no-fuss. You can put this pie together in less than 30 minutes. It does require 3 hours to chill so you do need to plan ahead. You can also freeze this cake (minus the whipped cream). I often freeze cakes and pies in the summer. Frozen desserts transport better in hot weather and they slice better. 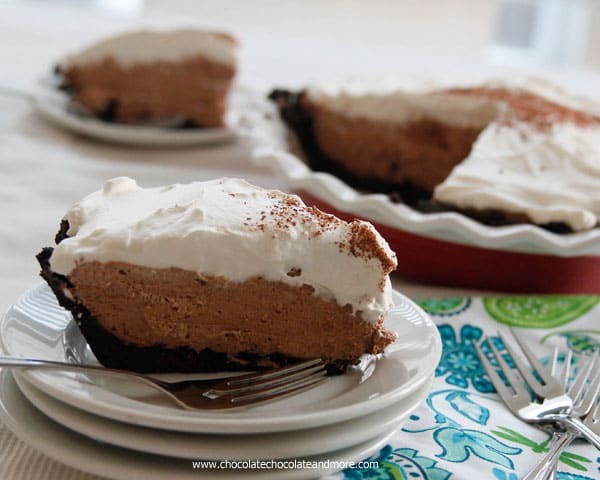 Joan chose the right name for this pie – Mint Chocolate Truffle Pie. The chocolate mint filling is decadently creamy and rich. Just like chocolate mint truffles in a pie crust. No one will guess how easy it is to make. You can also make individual servings for summer parties by putting the ingredients in muffin cups. Crush Oreos (with filling) in a food processor or place in a heavy plastic bag and use a rolling pin to crush. Combine crushed Oreos with melted butter until all crumbs are moistened. Press buttered Oreo crumbs into a 9 inch pie plate. Set aside. Place water in a small microwave safe bowl. Sprinkle gelatin over water. Microwave on high for about 40 seconds, until water is hot but not boiling. Remove from microwave and stir until gelatin is completely dissolved. Set aside. In a medium bowl, place mint chocolate chips. Heat in microwave for 60 seconds on medium power. Stir, if needed, heat again at 30 second intervals on 50% power until chips are completely melted and smooth. Let cool. Stir sweetened condensed milk and vanilla into cooled melted chocolate chips until smooth and completely combined. In a large mixing bowl, beat 2 cups heavy whipping cream until stiff peaks form. Fold chocolate mixture into whipped cream until completely combined. Fold in cooled gelatin water. Mixture will be soupy. Pour chocolate mixture into prepared crust and chill for 3 hours or until set. Before serving, beat remaining 1 cup heavy whipping cream with powdered sugar until stiff peaks form. Spread whipped cream over pie or serve on the side. Check out these other wonderful chocolate mint treats.